Medieval tiles were normally made by impressing designs into raw red clay blanks. The designs were carved on to wooden blocks. The hollows in the clay were then filled with contrasting white pipe-clay. But the series of tiles found at Tring in Hertfordshire were made in a different way. Here a talented and humorous potter drew the tiles through a coating of white slip. He then scraped the background away to produce a kind of ceramic strip cartoon. 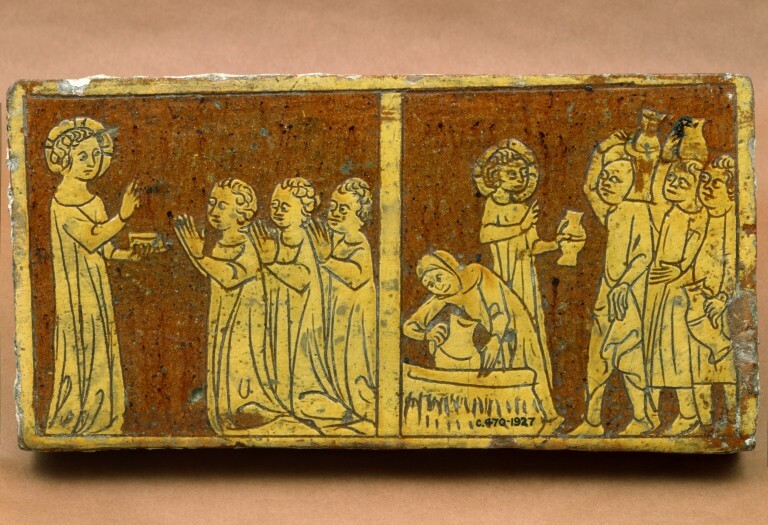 Lead-glazed earthenware tile covered with a white slip, carved and incised with scenes from the apochryphal and gospel accounts of the childhood of Christ. 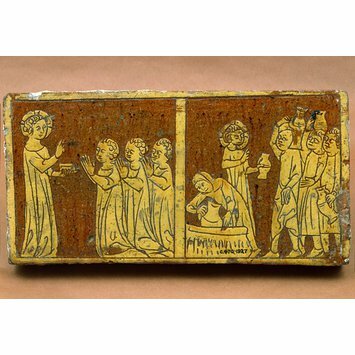 Tile of red earthenware with decoration representing incidents from the apocryphal accounts of the infancy of Christ. Executed by scratching through and cutting away a white slip under a yellow clear glaze. (21 June 1927) Joan Evans to Rackham: Her [Mrs Foulkes'] husband purchased them when they were reflooring a Church in the Tring district and she has had them for many years. The British Museum analysed their tiles in 2007/8 by thermoluminescence dating and the results said that they were made between 500 and 800 years ago. From the same set as eight tiles in the British Museum with subjects from the same source. Lead-glazed earthenware tile fragment covered with a white slip, incised and carved with apocryphal and gospel scenes from the childhood of Christ. Said to have come from Tring Church, Hertfordshire. English, made about 1330.